Once you click Get Started you get access to our sign up where you can add the Direct Booking Tool to your website. An average of 40% of online reservations are made outside of business hours. Are you missing these customers? Let your website do the work for you. Capture every customer, even while you are surfing. Why use the Direct Booking Tool? 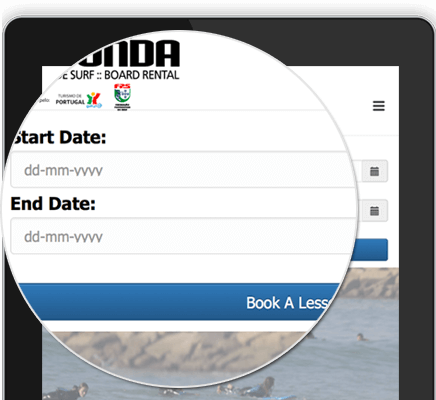 Why Surf Schools are using it? ​Frees up your time from constantly emailing + phoning to get a booking. Increases bookings because people only need to pay a deposit rather than the full amount. ​Allows you to be better organised. Automatically send a confirmation email to the customer with all their booking details. Set minimum number of people required per lessons. Close out days when you are full or closed. Add other activities such as SUP, Yoga, Kite & Wind Surfing. ​ It's free to set-up + trial. ​The only charge is a small booking fee that your customer pays for the convenience of being able to book online. "As I am a little IT-geek myself I know how much work goes into the development of a platform like this and how much can go wrong. The Surfholiday Direct Booking Tool runs super smooth and I really do like that they are constantly trying to make our life easier and offer the best and smoothest booking experience for our clients. We have tried a couple of smaller platforms which are trying to specialize in the surftourism market. They were all very basic and nothing to compare with the Surfholidays Direct Booking Tool. Plus they all had very little traction on the market and the return was never any good. We will definitely keep working together with them and are excited already what kind of tools they will be coming out in the future."" "SurfHolidays has become a great partner as their system saves us lots of time and effort which we can put into other issues and as a consequence to focus in what is really most important to us and to our business. Surfholidays system is most probably the most advanced and robust which we worked with. We tried other platforms but none was so specific, efficient and user friendly. We´ll keep our work with Surfholidays as it´s also part of our success and growth." Nuno Sequeira, Surf Lisbon, Lisbon. "We have been working on spreadsheets for years and wasted a lot of money on bespoke booking engines which amounted to nothing so we were hesitant at first to use another one but we have been working with Surfholidays for over 7 years now and they continue to help us grow. We´ve found their system extremely advanced and adaptable to our needs. We have only been live for a short time but already it has saved us a lot of time and effort which is vital for us as we are only a small team multi-tasking with various responsibilities so we are extremely happy with the system so far." Michaela Wolff, Extreme Algarve, Portugal.